Gonzaga's stunning loss to BYU doesn't just ruin a perfect season. It likely ruins the chances of notching a No. 1 seed in the NCAA tournament now. Previously the fourth best No. 1, the 'Zags (29-1, 17-1) fell to the No. 2 line after losing their first game of the season on Saturday. As stated before, Gonzaga's résumé isn't underwhelming by any stretch, sporting wins against Arizona, Florida and Iowa State in non-conference play. But due to the weaker-than-usual West Coast Conference this season (the Bulldogs beat San Diego by 58 points last week), a loss to any team not named Saint Mary's makes Gonzaga's road back to the No. 1 line pretty arduous now. It's possible to get back, but would take other teams slipping and obviously a WCC tourney title on behalf of Mark Few's group. So now to the more intriguing debate. 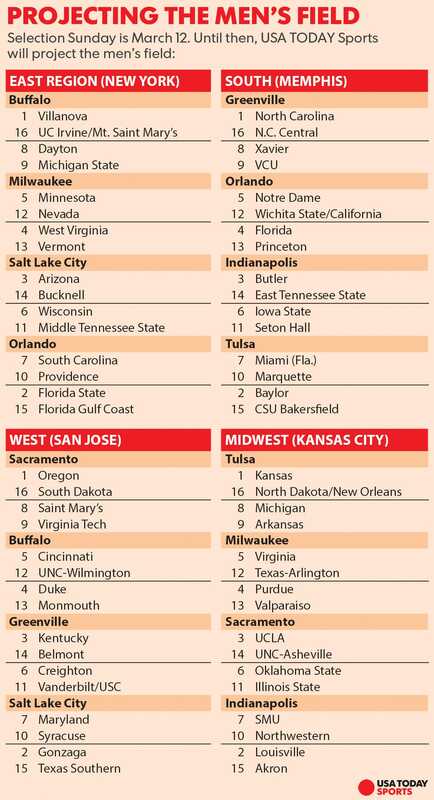 Which team replaces Gonzaga in the West Region? While Saturday's top-five showdown between UCLA and Arizona had a Final Four feel to it, the Pac-12 team with the most impressive résumé is Oregon (26-4, 15-2), which has a top-five RPI and is 11-1 against teams in the RPI top-100. Of the other No. 2 seeds, Baylor and Louisville both have six losses that are hard to work with. UCLA and Kentucky jumped to No. 3 seeds after their marquee wins, against Arizona and Florida respectively. But neither sport a profile worthy of No. 1, even if they looked title-ready on Saturday. ► Multi-bid conferences: ACC (9), Big Ten (7), Big East (7), Big 12 (5) Pac-12 (5), SEC (5), A-10 (2), AAC (2), MVC (2), WCC (2). ► Or highest RPI from projected one-bid conferences - (23 total): Vermont (America East), Florida Gulf Coast (Atlantic Sun), North Dakota (Big Sky), UNC-Asheville (Big South), UC Irvine (Big West), UNC-Wilmington (CAA), Middle Tennessee State (Conference USA), Valparaiso (Horizon), Yale (Ivy League), Monmouth (MAAC), Akron (MAC), N.C. Central (MEAC), Illinois State (Missouri Valley), Nevada (Mountain West), Mount Saint Mary's (Northeast), Belmont (Ohio Valley), Bucknell (Patriot), East Tennessee State (Southern), New Orleans (Southland), Texas Southern (SWAC), South Dakota (Summit), Texas-Arlington (Sun Belt), CSU Bakersfield (WAC). They do a good job of recruiting mid-range players that they turn into talented college players. A good reputation from all I've heard. Willie Veasley, who hails from Freeport, IL, always spoke about Butler, and it's program, as top notch, when asked about it, while home. He still talks positively about it.